Barnacle cover in the barnacle plots at Fogarty Creek was generally above 80%, which is surprising given that this area is a popular location for seals to haul out. Balanus glandula were much more abundant than Chthamalus dalli/fissus in these plots. Mussel cover in Mytilus plots was high and quite stable over time. The mussel bed at Fogarty Creek is so extensive and deep that we typically cannot find our bolts and need to rely on measurements and photos to locate the plots. 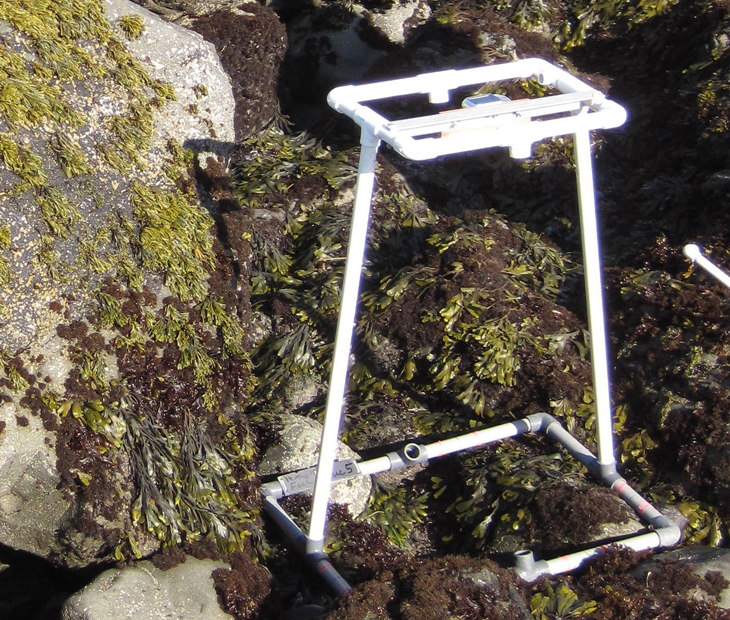 Fucus cover in rockweed plots fluctuated somewhat over time, but was generally around 60% or higher. Pelvetiopsis cover in its target plots plummeted after the initial survey, and remained low in all successive years. Barnacles were typically the most common taxa in these plots. 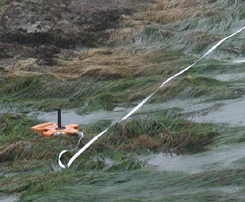 The target plots for Neorhodomela contained high cover of this red alga through 2006, after which a slight but gradual decline in cover occurred. Two “overstory” species—the boa kelp, Egregia, and the surfgrass, Phyllospadix, increased in cover during recent years, so it is possible that Neorhodomela was present under these species and had not declined substantially in cover. We have switched to a layering method for scoring photoplots, which will help to address these types of concerns. Limpets and littorines were the most abundant motile species in all plot types, but the whelk, Nucella spp was also common in Mytilus and Fucus plots and the turban snail, Tegula funebralis was sporadically common in barnacle, Fucus, and Neorhodomela plots. Phyllospadix cover was high throughout the duration of the study, and gradually increased in cover over time. Ochre star counts within our 3 permanent plots generally hovered between 200-400 for most years, but spikes of over 700 stars were counted in 2004 and 2006. 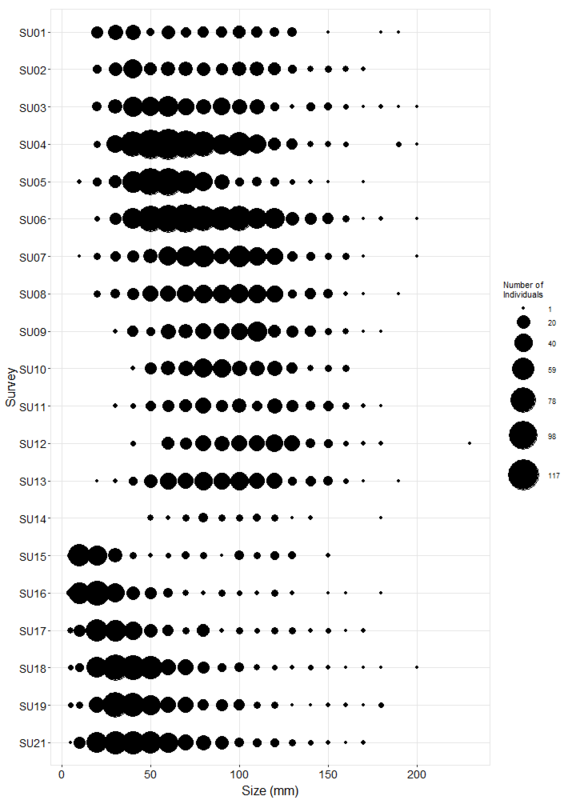 Size class data shows that these spikes in counts span the 40-120 range, so the increases were likely due to movement of stars into the plots from offshore habitat, rather than recruitment of new individuals to the site. 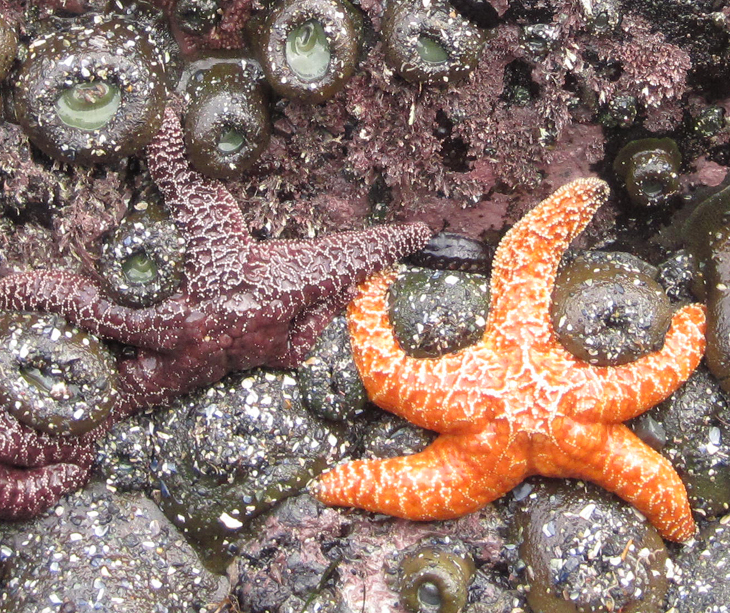 Ochre star numbers were down in 2014, and we expect them to decline further in 2015 due to Sea Star Wasting Syndrome.